Have a passion for the wildlife of South Florida and the Everglades? Enjoy talking to people and sharing your expertise? Join us at Flamingo Gardens as a Wildlife Sanctuary Guide. WS Guides will learn talking points on the animals that call our sanctuary home, and provide information to guests as they tour the facility. Must be comfortable initiating conversation with guests and learning specific facts about our collection. 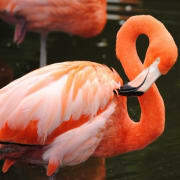 Flamingo Gardens is a Botanical Garden and Everglades Wildlife Sanctuary located in West Ft. Lauderdale since the 1930's. We have 60 acres of trees and tropical plants from all over the world, including Champion trees (the largest tree of their kind in Florida). In our animal sanctuary we take care of permanently injured wildlife and release their offspring into the wild. We have everything from alligators and bobcats to eagles and otters and a bear! We also have a half-acre enclosed Aviary filled with native Florida birds. We are looking for plant lovers and gardeners, and those who love our Florida Wildlife to volunteers as guides/docents within the park. Flamingo Gardens cannot survive without the help of volunteers like you. We have wonderful, long time volunteers and staff who will introduce you to the park and train you in whatever departments most interest you. If this interests you, please send an email to volunteers@flamingogardens.org or call 954-473-2955 x 134 to set up an appointment for an interview. The Volunteer Office is open Tuesday - Saturday, 9:30am - 5:00pm.